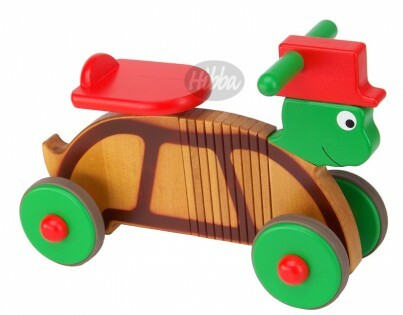 This rocking and ride on wooden turtle is our new design. The wooden combi turtle is totally unique and superb because it rocks and also has wheels so it can be used as a ride on toy, 2 in 1. When the child is bored of rocking you can very easy remove the turtle from the base so they can use it as a ride on toy. The pictures are not enough to emphasise the true quality of this toy. We know you will fall in love with this when you see him in real life. We have carefully selected this delightful turtle for its ingenious design and sheer quality. 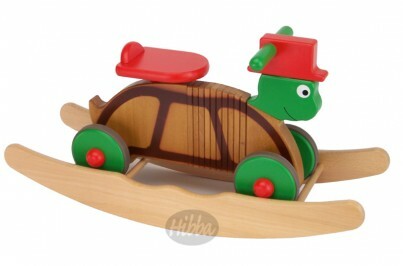 The turtle has a flexible wooden body which bends to allow the child to steer him. 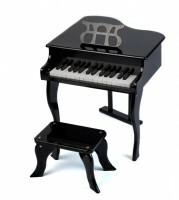 The front part of the body is made with a number of individual wooden pieces that have specially been joined together so that they flex and allow the child to steer. This is a great design without using any rubber or plastics. Crafted by hand by our master craftsman, this wooden ride on toy has been finished to an exceedingly high quality and specification. The wood used is solid beech, and is from sustainable resources. This turtle designed combi rock and ride toy is very distinctive with a lovely soft sheen finish and is individually made with attention to detail and quality, which makes this a special and distinctive gift. Available in natural wood and colourful finishes. 1. ORDERING AND DELIVERY INFORMATION 1.1 We ship via a national courier, which has a delivery time of 2 to 3 days. We can arrange for next day Special delivery, please contact us and we will advise you of the cost for this service. 1.2 We endeavour to process your order as quickly as possible and will usually despatch your goods within 5 days of receiving the order (subject to receiving satisfactory payment, see section 2 below). 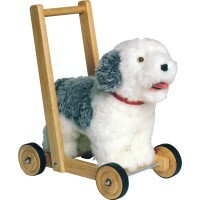 If an item is no longer available or is out of stock we shall inform you and advise you of the expected delivery time. We may contact you by telephone so please ensure that you have provided us a daytime contact number. By placing an order you confirm that you have provided us the correct billing address of your debit/credit card and the correct delivery address. In the case of the "Hibba Stool" please allow up to 28 days for delivery. Other products that are custom made and personalised, please allow between 10 and 21 days for delivery. 1.3 We cannot accept responsibility for delays in delivery caused by our suppliers or by any other third party. Hence we cannot be liable for an item that fails to arrive by a required date. 5. CANCELLATION RIGHTS CHANGE OF MIND 5.1 We are fully compliant with the Consumer Protection (Distance Selling Regulations) Act 2000, which allows for a 7 day "cooling off" period. If you decide to return an item due to a change of mind then you must contact us first by telephone anytime up to 7 working days starting the day after delivery. Once we have confirmed that the goods can be returned, you must ensure that the item returned is unused and in perfect re-saleable condition with all the original packaging and instructions, otherwise we will be unable to refund you. Upon satisfactory receipt of the goods we shall issue a refund for the cost of the goods only, EXCLUDING ANY DELIVERY CHARGES THAT YOU HAVE PAID, either by cheque or the original method of payment. However, YOU WILL BE RESPONSIBLE FOR THE COST OF RETURNING THE ITEM BACK TO US. If our courier collects the item then we shall deduct a collection fee of £15 from the price of the goods and the balance shall be paid to you. If you decide to arrange your own delivery then we would strongly recommend that you obtain a "Proof of postage" certificate from the Post Office (free of charge) as this will be required in the event of making a claim against Royal Mail for lost or damaged returns. 5.2 In the case of personalised products or any item that has been made to your specification, we regret that we are unable to provide a refund on these items. Such items are excluded from the Distance Selling Regulations Act 2000. If you are in doubt about placing an order for a personalised product then please contact us and we will be glad to assist you and provide further details. DAMAGED GOODS 5.3 Our policy on returns does not affect you Statutory Rights as a consumer. If the goods are received damaged then we will offer you a full refund or if you prefer an alternative product. In such as case please contact us by phone on 0113 265 8318 in the first instance. Please note that you must notify us of the damage by telephone WITHIN 24 HOURS OF ACCEPTING DELIVERY. We are unable to entertain any claim for damaged goods after this time period. This is a condition imposed by our carriers. We will then decide the most cost effective method for returning the product back to us. Once we have decided the method of return we shall pay for the reasonable return carriage of the goods. When returning an item back to us please enclose all the packaging, instructions, leaflets etc that came with the product, together with a brief explanation of the fault. If you decide to arrange your own delivery we recommend that you obtain a Proof of Postage from the Post Office when returning the item back to us as we would be unable to refund you the postage costs without this certificate. In the case of personalised products or any item that has been made to your specification, we regret that we are unable to provide a refund on these items. Such items are excluded from the Distance Selling Regulations Act 2000. If you receive such an item that has been damaged then will repair or replace the product. Where this is not possible, a full refund will be offered. FAULTY GOODS In the unlikely event of your item developing a fault, our policy for faulty items is set out as follows: 5.4 If your product develops a manufacturing fault within 7 days of accepting delivery we will offer you a full refund or a replacement item. 5.5 If your product develops a manufacturing fault after 7 days of accepting delivery, but within 3 months, we will aim to repair the product by sending out replacement parts to the customer’s address. Where this is not possible we will undertake the carriage costs incurred to get the item back to our warehouse for repair. We will aim to get the item repaired and back to you within 28 working days and if this does not happen we will replace the item. Where a replacement is not available a full refund will be offered. 5.6 Our warranty does not cover any item that is over 3 months old, unless there is a seperate manufacturer’s warranty in place. Please check with us and we shall advise if such a warranty applies to your product.